I live in Milford, Ohio 45150. I would like to plant 2 Princeton Sentry Ginkgo trees. Im looking for nicely shaped, nice central leader trees approximately 4 wide at the trunk 10-12 foot tall. I cant seem to locate any. Any help would be appreciated. My cell is 513.236.2457. Thanks, Scott Whissel. The Ginkgo is one of the most beautiful trees in the landscape, especially in the fall season. Every fall around Halloween you can always count on seeing the bright, clear, yellow fall color of the Ginkgo. No other tree has leaves with such clean, clear, yellow fall color. The leaves are so unique that once you learn Ginkgo you never forget it. The most interesting thing about Ginkgo that makes you love and respect it is its history. The mystery of how Ginkgo has survived for 270 million years is something I’ll never understand. Ginkgo has stood the test of time. A relic that was around during the dinosaur era and somehow survived through whatever nature could throw at it. Ice Age, Atomic Bombs, New York City. Ginkgo is the toughest tree known to man. Ginkgo is a large deciduous tree. It is dioecious, meaning there are male trees and female trees. The female trees produce the fruits that can be rather obnoxious. The fruit is actually a nut surrounded by a fleshy coating. When the fruit falls to the ground the fleshy coating emits a foul odor that smells like dog vomit. People that step on it will carry it with them as they go. The nuts are actually a delicacy in Asia. It is also one of the most popular medicinal plants on the market. Supposedly it helps with memory loss. Ginkgo makes a great tree for the landscape. Typically we choose male clones to plant in our yards. ‘Autumn Gold’ is the most popular male clone on the market. There are many dwarf clones as well. There is a ‘Spring Grove’ Ginkgo and a clone called ‘Jade Butterflies' that are both dwarf clones. Locally there are some magnificent specimens in Northern Kentucky and Cincinnati. Spring Grove Cemetery has several of the largest specimens in the area. There is another large specimen at the Behringer-Crawford museum in Devou Park in Covington. Another one of the largest trees stands in front of RC Hinsdale grade school in Edgewood Kentucky. The largest planting of Ginkgo is at the Cincinnati Children’s Hospital complex in Avondale. 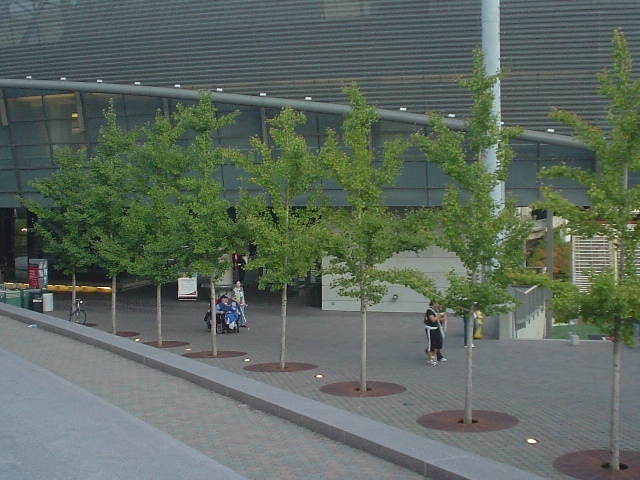 Over 100 Ginkgos were planted around the buildings. Let’s hope they are all male!